Today I printed the final impressions for my wood block and letterpress children’s book, Common Household Rhymes for the Modern Child. I printed the first layer of the title in copper ink, then moved my type just a touch and overprinted in black, to make a shadow on the words. I cranked the Vandercook proofing press at Zygote Press today for perhaps the 12,000th time. I found myself slowing down as I got close to the end, to enjoy the labor toward the completion of something that’s been in the works for almost three years. Literally making a children’s book—writing the rhymes, drawing the pictures, carving the wood blocks, setting the type, printing the words and blocks on a manual letterpress machine, stitching, and binding an edition of 100 copies—has been many things: a labor of love, a learning process, a blow stricken for the Old School. It’s also been a manufacturing job. We’ve heard this kind of language from the Community Partnership for the Arts and Culture for years: Artists and performers are the makers of our culture, laboring long and hard to make the objects and performances that make our lives worthwhile. It’s particularly true for artists who make objects. Consider Brinsley Tyrrell, firing glass on steel to make his stunning Ohio Landscapes. Or Stephen Yusko, artist in residence at Rose Iron Works. Or consider my sister, Toledo resident Kathleen Gill-Slee, whose Sherwood Inn Pottery has steadily increased production of functional whimsy in clay to meet demand. Making a children’s book from start to finish drove the point home for me personally. I’ve written about the work of artists and the way they build culture for a long time, but it is another thing to labor at a physical object for years and bring it into the world. 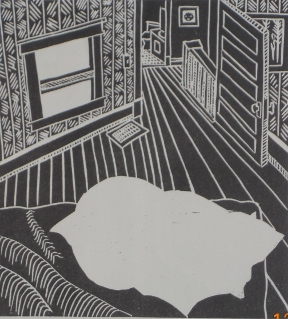 The people who see these prints on the walls at William Busta Gallery will see them as art objects, and they will think about them as pictures with rhymes. That is how it began for me, too—as words and pictures in my head. But as the images began to build up on these sheets of paper—and certainly as I began to stitch them into signatures—I began to think about making Common Household Rhymes as a manufacturing job. Consider this cat, Olga. 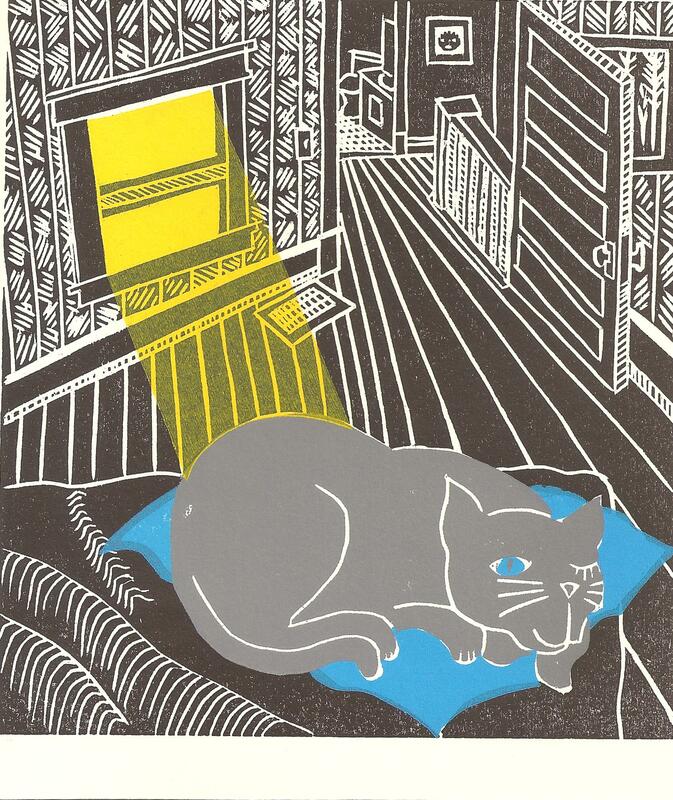 She stars as the long-suffering “grey cat,” waiting, not quite asleep in her slanted patch of sun. She’s 15 years old, and for most of that time was chased mercilessly by our other cat, the late Pablo, AKA “the black cat.” She is a much happier cat now that Pablo is gone. But let’s stick with Olga, shall we? She makes for a good demonstration of the way these pictures are built, one wooden block at a time. I drew the whole picture first, on a piece of wood that would become the black background plate. That image serves as a map for all the rest. 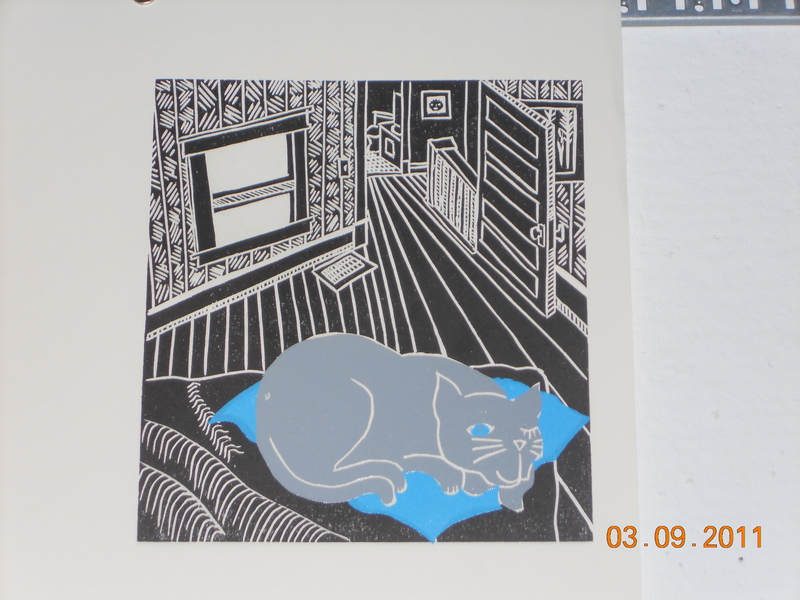 I printed it several times, so I could transfer the shape of the cat, pillow, and sunlight onto other plates. Then I carved all that out of the black image to leave the empty space behind. When it was time to print the color plates, I used the black background as a map to register the color blocks in their proper locations. In this case, I printed the black background first. I wanted the effect of the sunlight shining across the room, the pillow laying on top of the bed, and the cat laying on top of the pillow. So that’s the order in which I piled up the patches of ink. When I printed the light, I mixed opaque white ink in with the yellow so that it would have a little more substance: you can see through it, but there’s no question that you’re looking at yellow. Once each block was registered, I’d print about 115-120 of them. I printed extras because I knew there would be mistakes. Once the printing was done–all 17 pictures, all 83 blocks, plus the words– I cut the sheets to size, stitched them into signatures with linen thread and fabric, then bound the whole package in acid free, archival boards with cloth. All of which brings me back to those labels I printed today. Attaching those is the the last bit of and hand work. experience. When my kids and yours read this, I hope they connect with the fact that one person did it, from start to finish. Book Lovers & Parents of Smart Kids: Join Me for Drinks? Facebook friends and readers of this blog have peeked in the window on something I’ve been doing for almost three years. 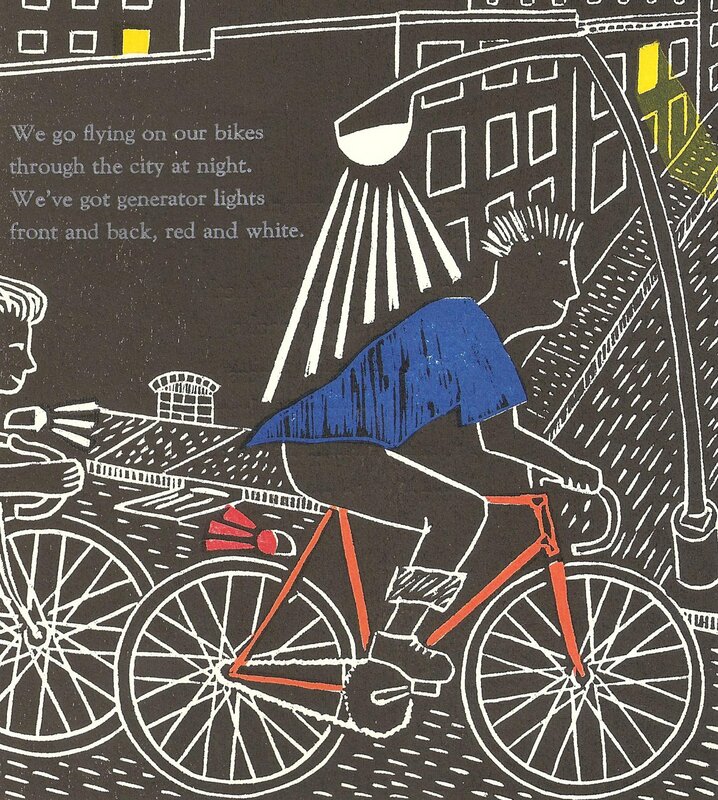 The happy bicyclist in my avatar, and the wheels and street scenes that appear at the top of this page are part of a children’s book I started making in February, 2009. 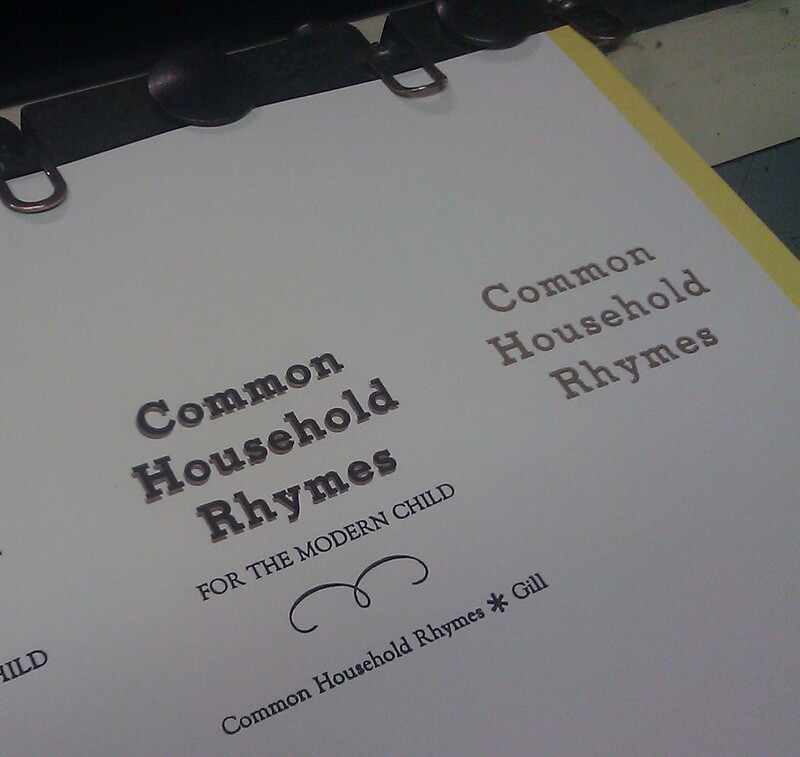 Using wood blocks and moveable type, I’ve nearly completed Common Household Rhymes for the Modern Child, a collection of multicolor relief illustrations, and accompanying rhymes. I’m releasing it Friday, December 2 at William Busta Gallery. I hope you’ll join me. I wrote, illustrated, carved, typeset, printed, and bound it. There are 74 wood blocks, eight linoleum blocks, and one block cobbled together out of wood and copper wire used to make each book. A total of 17 pictures, plus moveable type. We’re talking old school. I’ve hand cranked the cylinder of a half-century-old Vandercook proofing press at Zygote Press 10,000 times. I’ve adjusted registration by the width of a sharp pencil line, slipping in whisper thin strips of lead, and cranking it over again. I’ve stitched 100 bindings. So you can imagine I am, shall we say, enthused to send this out into the world with a party. I’m exceedingly grateful to Bill Busta for believing that to be a good idea. So I hope you will join me at his gallery to be among the first to see this collection of children’s rhymes and accompanying pictures. "After your bed time, the moon gets up high. The grown-ups keep talking. Nobody knows why. 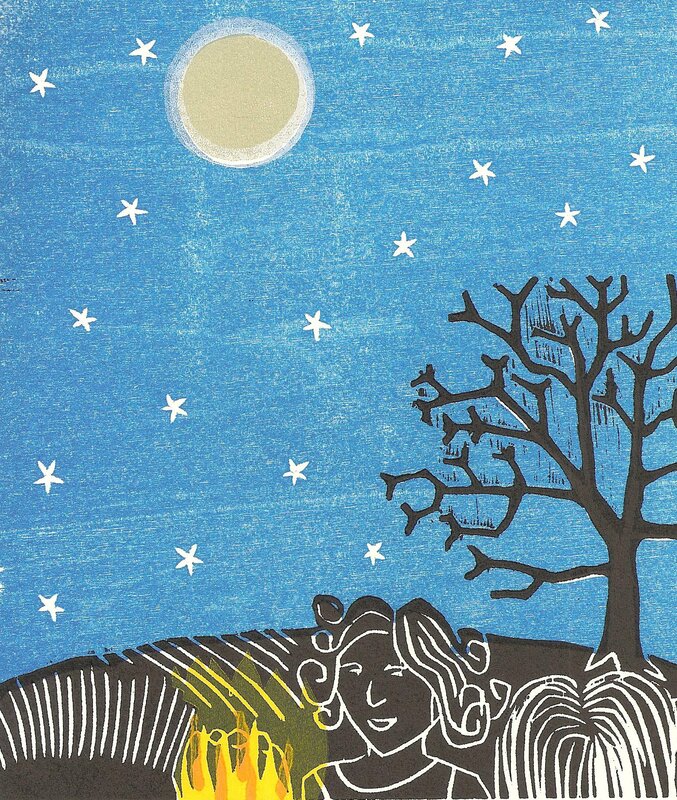 The rhymes play in the realm of domestic life in a decidedly Cleveland setting. There’s vernacular architecture, and a couple of nods to specific buildings. There are cats, mice, an orange fish, a bicycle ride in the depopulated city at night, and a workbench cluttered with tools. There is the true fact that adults get to stay up much later than children do. The subjects are very familiar to kids, but the words don’t talk down to them in any sense. In fact, they aim high, calling on kids to observe, make connections to the world around them, and to other rhymes, and bits of culture. This is a book for parents of strong readers. I’ll continually add to this story on this blog, but for now, I hope you’ll save the date and join me for my book launch. We’ll have some wine and light horsd’oeuvres. It’ll be fun. At least it shouldn’t be criminalized. I reserve judgment on DC Councilperson Muriel Bowser’s attempt at a pedestrian-friendly law only because I don’t know what impact slower residential streets would have on people who currently don’t walk or cycle. Bowser has proposed reducing the speed limit on the Federal City’s residential streets from 25 miles per hour to 15 miles per hour. Maybe a lot of people would walk or ride bikes if the cars went 40 percent slower on residential streets. I don’t know. I don’t think the councilperson knows either. According to the article, Bowser says “concerns over speeding in residential neighborhoods has [sic] discouraged residents from walking and cycling.” But I’ve lived in DC and walked to work every day for years, and that doesn’t square with the reality I saw. Additionally, the graph (which seems to be the one Bowser cited) shows that the significant payoff in terms of reducing “the probability of pedestrian fatality” comes at about 45 kilometers per hour, which is almost 28 miles per hour, which is already faster than the speed limit on those residential streets. The likelihood of pedestrian fatality in a crash goes up when the speed on impact goes up. But below about 45 kph (about 28 mph), the increase is pretty small. If the speed limit on those streets were 65 KPH (40.3 mph), and the proposed reduction were to 40 KPH (24.8 mph, which is almost identical to the current limit) then we’d be talking about a significant payoff. That change would reduce the likelihood of pedestrian fatality from about 30 percent down to less than 5 percent. But the payoff in the Bowser proposal (can we call it that?) would be a reduction in the probability of pedestrian fatality from less than 5 percent down to maybe 3 percent. It’s a whole lot of change for not much benefit. Further, I certainly don’t have the impression that 25 mile-per-hour motor vehicle traffic has much impact on the decision to walk on the sidewalk. Neither do I believe cars traveling at 25 mph have much impact on the decision to ride a bike. Residential streets at 25 miles per hour are a pretty friendly environment. Such a significant change, from 25 mph to 15, could even exacerbate the tension between motorists and other modes. A 40% reduction of the speed limit is huge. Motorists will blame it on cyclists, and it will increase the perception of them as a special interest group. But my real concern is about unintended consequences. Bicycles have to obey laws, too. A significant appeal of bicycling—and I would say a defining characteristic of the experience—is that you get out what you put in. Cycling is satisfying because it rewards effort. If you want to get there faster, you push a little harder. Speed is earned not only in the moment by that pushing, either: the ability to go fast is built over time—weeks, months, and years. 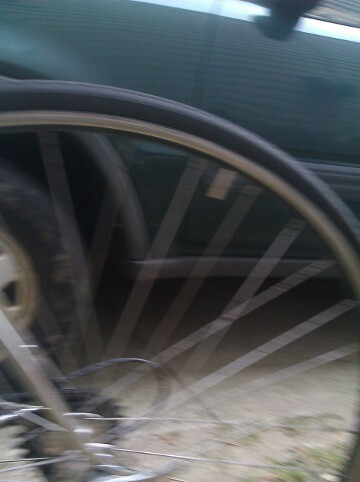 And for a whole lot of cyclists, easy cruising speed is faster than 15 miles per hour. This proposed law flies in the face of that hard-won capacity for speed, and at a very low threshold. When a group of people is motivated by the intrinsic result of their effort, a law putting that kind of limit on their reward invites problems, including scofflaw cyclists, and the righteous indignation of the same people the law would seem to be trying to help. It creates a new way to levy fines on a group of people who already feel marginalized. In brief: I just don’t like it. But hey, I’m open. Persuade me. 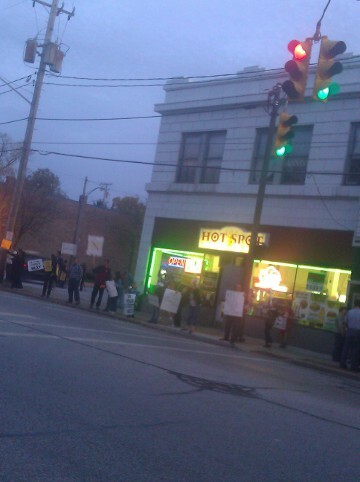 Woodward residents picketed the Detroit Theater in opposition to McDonalds' proposal to demolish it and build a drive-thru restaurant there. Lakewood doesn’t have any of its most hotly debated issues on the ballot this year. There’s no opportunity to vote on whether McDonalds will demolish the old Detroit Theater and bring its drive-thru traffic to Woodward. There’s no ballot issue to decide when the school system will finally finish its reconstruction project. There’s no school levy on the ballot. Even Mayor Mike Summers is running unopposed. But one defining bit of legislation does have a representative on the ballot: Councilman David Anderson is running to keep the post he was appointed to early this year. Anderson has introduced a bit of legislation that touches at a debate that could define the way our commercial corridors evolve. The legislation would regulate drive-thru windows by limiting the conditions under which businesses could build and operate them. Anderson asked the Planning Commission to study existing drive thrus and create rules to help the city protect its residents from the noise, traffic, and smell that would go with adding more. It’s too late for the legislation to apply to McDonalds’ proposal, but it would apply to the rumored intentions of the Taco Bell franchise across from the Library to build a new building across from the YMCA—on a site just two blocks west of the proposed McDonalds, immediately across the street from a Dairy Queen, immediately adjacent to a drive-thru oil change shop and a drive-thru car wash.
Drive-thrus are great for highway exits. They are not great for a very densely populated city striving to market its walkability, or the character of its neighborhoods. According to the Planning Department’s study, that would be the densest concentration of drive thru businesses in the city. That also happens to be the corner of my street. For that reason alone, I am grateful for the legislation, and for the willingness of Councilman Anderson to take it up. By the time anyone reads this, Mr. Anderson will almost certainly have won his race. But the race to keep Lakewood’s appeal to homeowners–and balance their interests against the businesses willing to invest here–is not going to be over any time soon. And that’s a much bigger battle than my little corner of the city. Election Day is about Choice. If the city can keep its appeal to people who like walking neighborhoods with local character, it will continue to be a place where people choose to live. If the city fails, those people will exercise their choice by leaving. I have lived this fight for as long as my family has owned our house. In the dozen years we’ve lived just a few houses north of Dairy Queen, my family has seen a steady stream of commercial proposals that would significantly damage the quality of life in the neighborhood so that one business or another could have its way. Its not that my neighbors and I don’t like business. When Hollywood Video built on the site of the former sticky bun purveyor known as Miller’s, no one complained. When Hollywood Video was replaced by the parts retailer Auto Zone, no one complained. There are plenty of other examples. But when Denny’s restaurant proposed building a restaurant and operating it 24-7 to cater to the neighborhood’s thriving bar scene, people got worked up. When the owner of an entire Detroit Avenue block sought to demolish three houses, replace them with a parking lot for the same collection of bars, and have the city pay for it, we got worked up again. When the same owner sought to demolish the Civil War-era Hall House, we tried to preserve that piece of Lakewood’s history. We lost that one, without fanfare, on the day after Christmas, less than a week before Tom George left office. When a social service agency illegally set up commercial counseling services for 36 publicly subsidized clients transitioning out of homelessness at a poorly maintained—and residentially zoned–apartment building, we went to battle yet again. For a city like Lakewood—clamoring for tax dollars, struggling to maintain property values—these battles are never simple, clear-cut affairs. Consider the rumored Taco Bell. The swatch of land in question sits beneath a long-troublesome building across from the Dairy Queen. I say ‘long-troublesome’ because for years, its former landlord neglected significant structural damage. Look along the property’s edge, and you can see the walls buckling dangerously outward. Chunks of concrete have fallen from the building’s window sills, lentils, and mullions. Some chunks as big as an adult’s thigh. They fall crashing to the sidewalk below. Fortunately no one has been hurt. Finally, last spring, the building sold. And right about that time, the rumors began to circulate. The new owner let his tenants know that he was talking with Taco Bell, courting the company to move from its current location across from the library. The tenants—a chiropractor, a hair salon, and a successful guitar studio—had all been steady, for years. But the rumors of Taco Bell and impending demolition frightened them all off. Now the building sits vacant, bringing zero revenue. It still has all its structural issues. Something’s gotta give. I’ve lived in the neighborhood for a dozen years, and two consecutive landlords have failed to do anything about that building. It’s a property that defines “demolition by neglect.” Now, odds are, the cost of repairs would outweigh the profitability of the place. The building seems doomed to demolition. And if the right proposal came along—like the YMCA’s one-time interest in a day-care facility there—I believe my neighborhood would be enthusiastically supportive. The steady stream of new businesses targeting this neighborhood—from decent restaurants to the video store to the auto parts store –show that this is a city that can wait for the right proposal. We can afford to hold businesses to standards of operation that keep the surrounding neighborhoods palatable for the neighbors. We don’t have to jump at the first opportunity, if it would do more harm than good. And since we can’t count on owners to care what happens to their property after they sell it, we need regulations that will ensure that businesses play nicely. I’m glad to have a councilman that will take this on.